Place the extruder stand/heating block onto a hot plate. Insert a thermometer into the well provided in the heating block. Switch the hot plate on, and allow to reach the desired temperature. Allow the temperature of the heating block to reach the desired value (approximately 15 minutes). Hydrate lipid mixture using a suitable buffer for >30 min. The lipid suspension should be kept above the phase transition temperature of the lipid during hydration and extrusion. To increase the efficiency of entrapment of water-soluble compounds, one may subject the hydrated lipid suspension to 3-5 freeze/thaw cycles by alternately placing the sample vial in a dry ice bath and warm water bath. 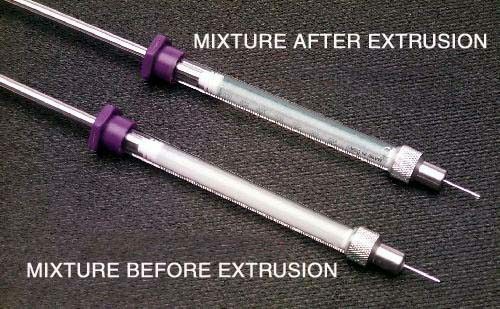 Once the sample is fully hydrated, load the sample into one of the gas-tight syringes and carefully place into one end of the Mini-Extruder. Note: To reduce the dead volume, pre-wet the extruder parts by passing a syringe full of buffer through the extruder; discard the buffer. New syringes may have tight fitting parts; to facilitate extrusion, pre-wet syringe barrel and plunger with buffer prior to inserting plunger into barrel. Place the empty gas-tight syringe into the other end of the Mini-Extruder. Make sure the empty syringe plunger is set to zero; the syringe will fill automatically as the lipid is extruded through the membrane. Check the temperature of the heating block BEFORE placing the assembled extruder apparatus into the heating block. The temperature must be below 80oC, or the syringes will be damaged. NOTE: The extruder apparatus must be fully assembled before inserting in the heating block, otherwise it will be damaged. Insert the fully assembled extruder apparatus into the extruder stand. Insert the hex nut so that any two opposing apexes fall in the vertical plane. Use the swing-arm clips to hold the syringes in good thermal contact with the heating block. NOTE: The extruder apparatus must be fully assembled before inserting in the heating block, otherwise it will be damaged. Allow the temperature of the lipid suspension to equilibrate with the temperature of the heating block (approximately 5-10 minutes). Gently push the plunger of the filled syringe until the lipid solution is completely transferred to the alternate syringe. 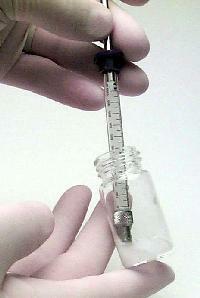 Gently push the plunger of the alternate syringe to transfer the solution back to the original syringe. Repeat steps 9 & 10 a minimum of 4 times (total of 10 passes through membrane). In general, the more passes though the membrane, the more homogenous the lipid solution becomes. The final extrusion should fill the alternate syringe. This is to reduce the chances of contamination with larger particles or foreign material. The lipid suspension should begin to clarify to yield a slightly hazy transparent solution. The haze is due to light scattering induced by residual large particles remaining in the suspension. These particles can be removed by centrifugation to yield a clear suspension of SUV. After the final extrusion, remove the Mini-Extruder from the heating block. Remove the filled syringe from the extruder and inject the lipid solution into a clean sample vial. IMPORTANT: When removing syringes, pull the syringe straight out of the extruder; removing at an angle could result in cracking the syringe. Store the vesicle preparation above the transition temperature of the lipid during the experiment. When not in use, store the vesicle solution at 4°C. Do not freeze. Vesicle solutions are not stable in aqueous media for more than 3-4 days when stored at 4°C. Storage of vesicle solutions at higher temperatures and pH 8 may reduce the lifetime of the vesicle suspension. Clean apparatus thoroughly before using with a new lipid preparation.